Chris has been a strong advocate for the Icelandic horse and supporter of the Association for more than a decade. At various times she has served on the Executive (Board of Directors) for the Association, edited and published the OIHA quarterly newsletter, managed the OIHA website, ridden in the World Icelandic Horse Championships in Europe representing Canada, and helped organize and manage Icelandic horse training clinics in Canada. She has studied with horse trainers in Canada, the United States and Europe and has been an active participant in Icelandic horse and gaited horse clinics in Ontario where she has been generous in sharing her knowledge and enthusiasm for riding and training Icelandic horses. She epitomizes the concept of life long learning in the equine field. 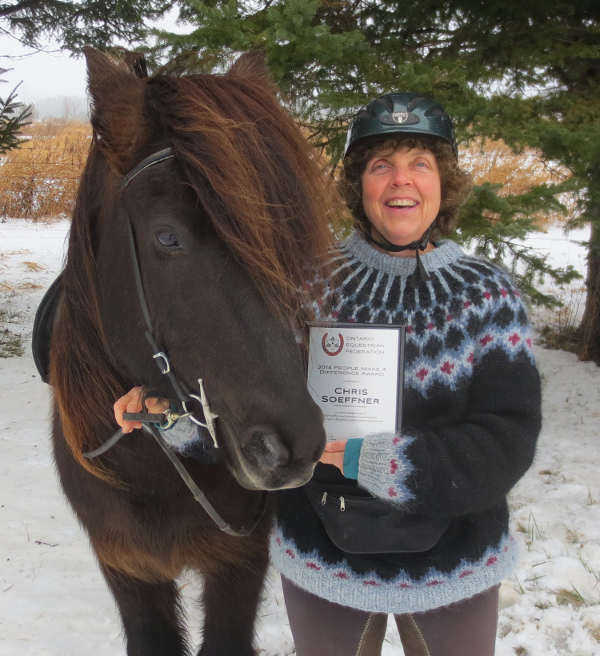 She has been an excellent ambassador for the Icelandic horse through participation and support of social gatherings, charity events and gaited horse events throughout the Province. She owns, trains and rides two Icelandic horses. Chris’s knowledge, experience and support for the Association and the sport make her a very speccial person in the Icelandic Horse community. Her willingness to share that knowledge and help others, young and old, qualifies her as truly a person that makes a difference. ⟵Did you know? We have OIHA apparel.